Color can be hard. 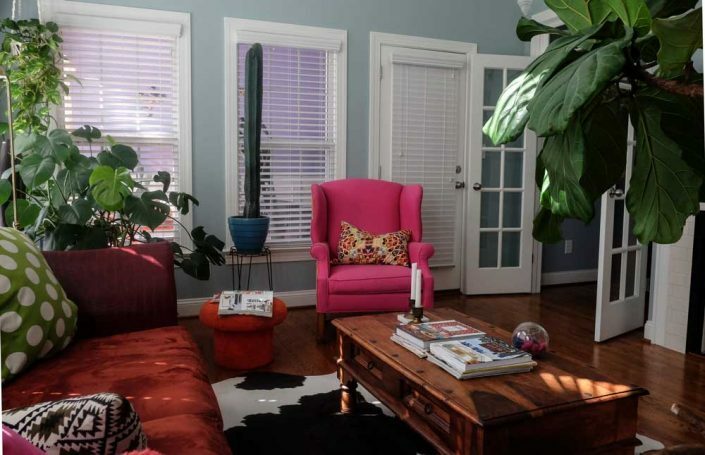 For many, when designing a home, working with color can be one of the greatest challenges. But there are some who embrace it, and Stacey Blake is one of those people. The woman behind the popular interior design blog, Design Addict Mom, defines the design aesthetic in her North Carolina home with just three words – colorful and bold. 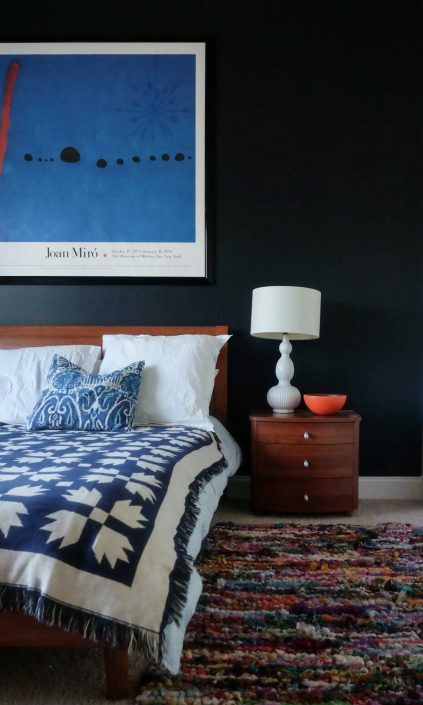 A step into Stacey’s home, and it’s that embrace of rich hues and bold patterns that stands out. It’s a place where you are enveloped by the unexpected, and are so happy to be there. Throughout each room, those sources of inspiration can be spotted. Natural elements like plants bring a vibrant green into the home’s living room. And plant life is echoed again in the Nana pink wallpaper in the home’s dining room. A backdrop that transports you to the great outdoors. Growing cacti and succulents are spotted throughout the space. And on the patio, Blake has designed a quiet oasis where plant life abounds. Beyond walls painted in rich hues of pink, blue and turquoise, Blake has brought color home with art. The home’s gallery walls feature pieces by Lana Gibson and Atlanta fashion illustrator Edwina Owens Elliot. On a bench, a signed piece by Synthia Saint James is instantly recognizable as the cover art for Terry McMillan’s Waiting to Exhale. For the boys, their bedroom’s silvery-blue walls are a great backdrop to vibrant shades of orange, yellow and green. The colors dominate the space on a world map mural that covers their bedroom wall. On an opposite wall, a kid-focused gallery wall featuring a mix of paintings, typographic pieces and homemade art, all in primary colors, brightens the space. In every room in her home, Blake’s confidence with color shines through. And the end result is truly refreshing. This home doesn’t feel southern or family style, but instead feels exactly like what Blake explained – her home is an expression of who she is.